The Giclée process enables the image to be printed directly onto museum-quality canvas material, so prints will not separate over time. Protective spray coating is applied to the surface of each print to help prevent scratches and other damage. The print is wrapped around a stretcher frame so that the photo's edges are visible on the sides of the frame, or you may select a black or white border. Metal Prints are created by infusing dyes directly into specially coated aluminum sheets, creating truly archival works of art. 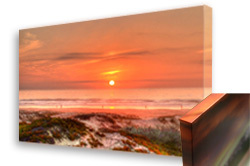 Metal Prints are highly durable, waterproof, weatherproof, and ultra scratch-resistant. The unique printing method gives your photos a vibrant luminescence with incredible detail and resolution. Choose from High Gloss and Satin finishes. When hung, these stunning prints will float off the wall. Wood Prints are creating using a mixture of Maple plywood (from the U.S.) Canadian Maple and Russian Birch plywood. In addition to using a UV ink, each board is pre-coated with a sealant that protects the wood and keeps the ink from absorbing into the wood and dispersing. This pre-coat provides a more “high definition” look for the image. After printing apost-coat of an additional UV resistant sealer is applied that provides additional resistance to UV light, scratching, and moisture. Acrylic Prints are either photographic prints or metal prints paired with polished acrylic for added depth and a high-impact, radiant display. This is the most costly print of the 4 options listed, but will transform your favorite image into stunning vibrant wall decor. These days you can get an image printed on just about anything. So please feel free to inquire about other forms of prints, like Wall Murals, Acoustic Prints to absorb sound (great for restaurants), Panel & Cluster Splits, Tiles and more!